← Do you have an Ancestor laid to R.I.P. in South Australia? Cheltenham Cemetery, here in South Australia, is one where the recycling/ renewal of graves, because the leases/ grants have expired, seems to be progressing at an alarming rate. Three months ago I was shocked to discover that the grave of my Great Grandmother, whose lease is still current, had one of those horrid expiry notices on it. The on-line record shows that the lease is indeed still current but had I not paid a timely visit to check on my many “rellies”, laid to RIP at Cheltenham, I would never have know that Eliza Jane’s sacred place had been marked for destruction. Well, after a considerable amount of persistence the Records Department finally confirmed, in writing, that a mistake had indeed been made and the expiry sign removed. However, other information I’d requested e.g. when was the notice of the expired leases published and why had I not received a letter advising of Great Grannie’s “expired” lease was never answered. My last email advised that because I had been unable to receive a response my only choice now was to take it to a “higher authority”. 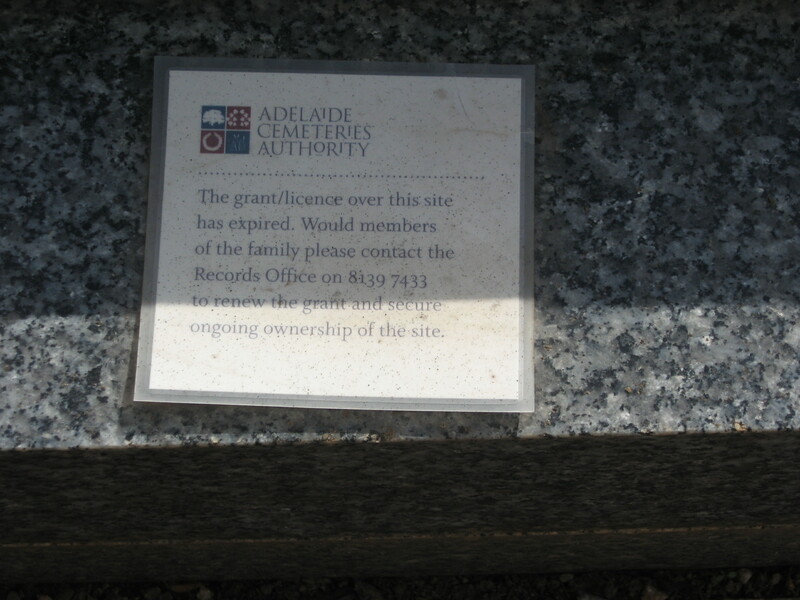 Time passes, other matters demand priority and on coming back to look into this niggling problem other inconsistencies appeared, especially those related to the relevance of the on-line information provided by the “Adelaide Cemeteries Authority” on expired leases/ grants. Most outstanding is this list which made me think that there were only a relatively few graves under threat right now. However, on closer examination it became very clear that most of these burial sites have been “re-developed” already and, it would seem, that those remaining are so “chocka block full” with at least 2, 3 and sometimes 4 previous family burials that it’d be pretty jolly difficult to shove another person into this relatively small space. So, just a few days ago, I did take the matter to a “higher authority” as I’d already advised. When sorting through the on-line information it doesn’t take long to work out that the responsiblity for Cheltenham Cemetery, West Tce, Enfield and Smithfield is that of the South Australian Government. 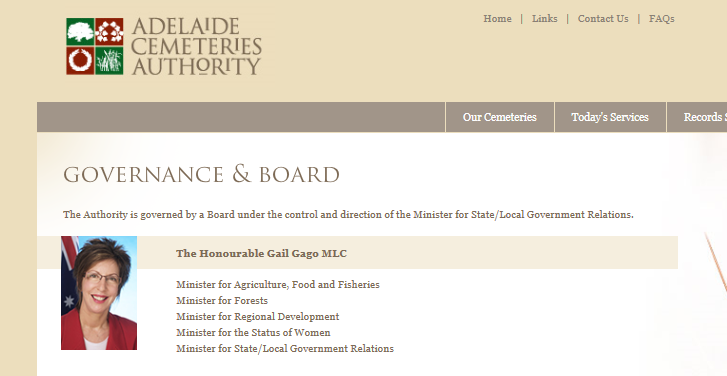 In 2001 the Adelaide Cemeteries Authority Act was passed and the Adelaide Cemeteries Authority Governance Board was formed and is answerable to the SA Government re: the management of these 4 cemeteries through the Hon Gail Gago MLC. Further checking shows, on the website for our South Australian Premier, that The Honourable Gail Gago MLC is indeed “Minister for State/ Local Government”, so all is looking “okey dory” I reckon. However, today I was advised by the office of Ms Gago that this is not her responsibility and so my request has been passed onto the Attorney General, John Rau. Phew… sounds a bit like another “groundhog day” to me cos I’ve sure been down this path before with “Parliamentary bureaucracy”. Hopefully it’s just a hiccup, a mistake, a mixup and very soon I’ll get my request passed onto the relevant person before another South Australian grave is “recycled” … possibly without the knowledge of the descendants. Maybe I’ve got this wrong and maybe I’ve mixed up my facts?… if so, I’m very happy to stand corrected. Any ideas/ suggestions as to how best move forward ensuring that those whom have Ancestors laid to R.I.P. in South Australian cemeteries are at least given the best opportunity possible to preserve their Heritage, Family History and Sacred Spaces are most welcome. Thanks. It’s been made clear that the names on this list are of the person who owns the lease/ grant, not the person whose gravesite it is. This means that when doing a search on that person’s name and it shows the site has been redeveloped it’s referring to the burial site of the grant holder in another part of the Cemetery. It seems that none of the gravesites on this list have yet been “re-developed” which is good to know. I draw you attention to the advice on the notice above. 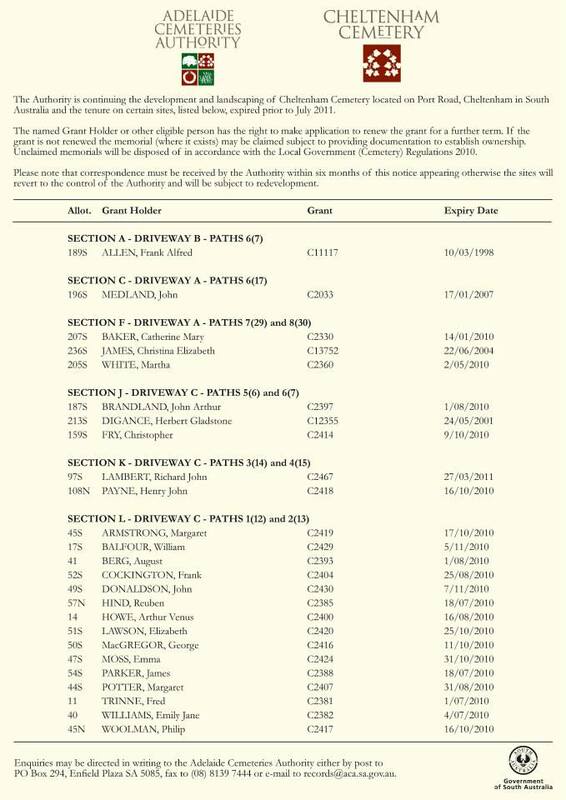 So, if you know someone who is related to any of the Grant Holders named above, or who know the person buried in the Allotment, please let them know that the lease has expired. I certainly was confused, as were many others, and it’s something to keep in mind when providing the Government with feedback on the writing of the regulations which will clarify exactly how the new “Burial and Cremations Act” will be enacted. Many thanks to the person who provided this information. It’s a shame she does not want her name mentioned but I do respect this wish. How infuriating! Thank goodness you rescued Great Grannie’s resting place. I wish you the best of luck. It’s a shocking situation. I’m not sure whether it’s her spirit, her mum’s or my mum’s that is “keeping me on my toes”? Bless them all. They appear to be doing whole sections without regard to date. We are in process of renewing my husbands brothers grave, which was a 50 year lease, many people would still be thinking these graves had 100 year lease. You also have to pay an extra fee if you dont have the original deed, just another way of making more money. Indeed Anne… 😥 Huge sections have been “re-developed” within a very short time and, since my mum and dad were buried just 6 years ago, parts of Cheltenham Cemetery are now hardly recognisable. So many of the beautiful old headstones gone!!! … Tragic. Am very glad you’re aware and able to keep the Burial Site of your husband’s brother safe Anne. Good for you!!! The local newspapers in the electorate of any politician you’ve contacted. Name and shame, that’s the only way they will take action. Drag them through the mud Catherine. They wouldn’t hesitate to do it to you. I don’t believe graves should be re-cycled but that’s another argument, for another day. What is important, right now is that people speak out loudly and clearly to ensure that the regulations, as they now stand, are at least being followed. I’m concerned that, because there’s a gap between the new Legislation being “assented” and it actually “commencing” that some procedures are not being followed to ensure that people have an opportunity to renew leases before the graves are destroyed. I’ve been assured that my query has now been passed to the correct dept… 🙄 which I’ll certainly follow up on. It’s very hard being a lone voice and also much easier for them to ignore. Thanks for your comment Kim. ” We acknowledge receipt of your email to the Attorney-General’s Department. For a reply to be provided, all correspondence must include a return postal address. Your email has been forwarded to a departmental officer for review. Once your views and suggestions have been carefully considered, depending on the nature of your correspondence, you may receive a reply via Australia Post. Please note that internet and email are not secure mediums to transfer information. If your message is sensitive, please use the postal address below. I certainly appreciated getting a reply but sadly it doesn’t make me at all confident that those Gravesites, in the GX Section of Cheltenham Cemetery, are given due consideration before being destroyed. Maybe they are… but I don’t know that. Hi Frances, Anne and Kim… just letting you know that I’ve updated this post with new info that’s just dropped in on me from “Cyberspace” 😯 Toodle-ooo for now. Many years ago when they first started reusing the graves I jumped up and down, wrote letters to the Advertiser and Messenger Press and you know I did not get any response at all. At that time I managed to save the grave of my husbands Great parents although we only saved the centre plot with the headstone not the other two with it. It wont be long and that lease will come up again. The first time I managed to get quite a lot of people to put in for it, sadly most of those are now deceased and it is unlikely I can afford to do it again and it may end up lost anyway. Its a sad situation. Why cant we have the same rights as our native people? That is terrible Anne… I’m so sorry 😦 Thankyou for sharing… am sending a “virtual hug”. It’s almost as if they think if they ignore you … you’ll just go away. During the past 3 months I have emailed the Records Department of the ACA at least 4 times, maybe more (must count them)… and in the last one I advised that if I didn’t get an answer, I’d have no choice but to take the matter higher, which I’ve done. You can’t go much higher than the Attorney General who is responsible for the Governance of ACA on behalf of the South Australian people. So, when people point the finger and accuse me of “spreading misinformation”, as though it’s a deliberate act, they’re “barking up the wrong tree”. After getting no reply to my continual questioning, and concerned that the Graves around my Great Grannie were likely to be “re-cycled” very soon, I wrote advising the public of this situation, in all good faith. To let people know that I have now received a most informative, and respectful reply, to my request which I’ll elaborate on soon in a new post. Suffice to say that I’m pleased to have persisted with the expectation of a reply to a few simple questions which the Records department at Cheltenham Cemetery whom, despite my continuing respectful (and clearly documented) queries, have refused to answer. It is indeed good to know that my concerns have been noted and answered by the South Australian Government which oversees the Board of the “Adelaide Cemeteries Authority” which manages 4 cemeteries on behalf of the South Australian Government only one of which is Cheltenham Cemetery. For those whom continue to pass on mis-information, manipulate the truth and seek to silence me with typical bullying strategies… I say that initially people may be sucked in but eventually the absolute truth will prevail.